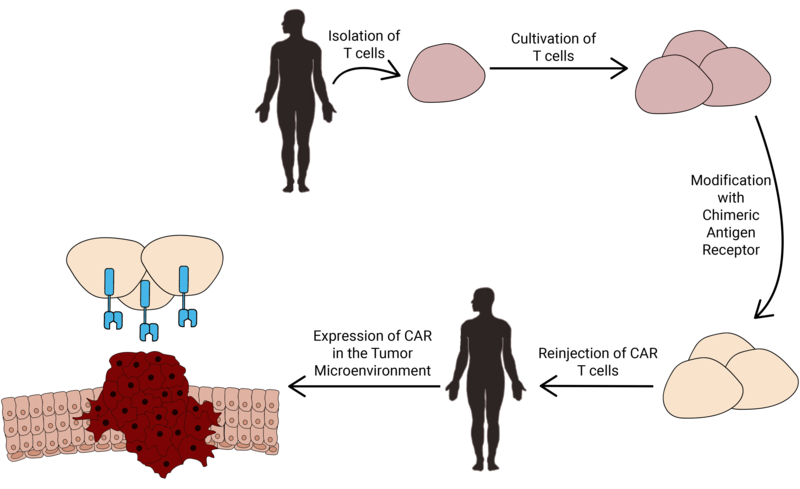 CAR T cells are immune cells that are artificially engineered to express a specific chimeric antigen receptor (CAR), which have demonstrated great potential in fighting cancer. Exemplary is the structure of a chimeric antigen receptor, which is composed of an extracellular recognition domain derived from monoclonal antibodies and an intracellular domain composed of signaling subunits. Chimeric Antigen receptors (CAR) are artificially generated recombinant receptors showing both antigen-binding and T cell activating abilities (Sadelain et al., 2013). CARs consist of an extracellular recognition domain derived from monoclonal antibodies and an intracellular signaling domain including CD3- and costimulatory domains aiming to trigger endogenous signaling pathways of T cells. 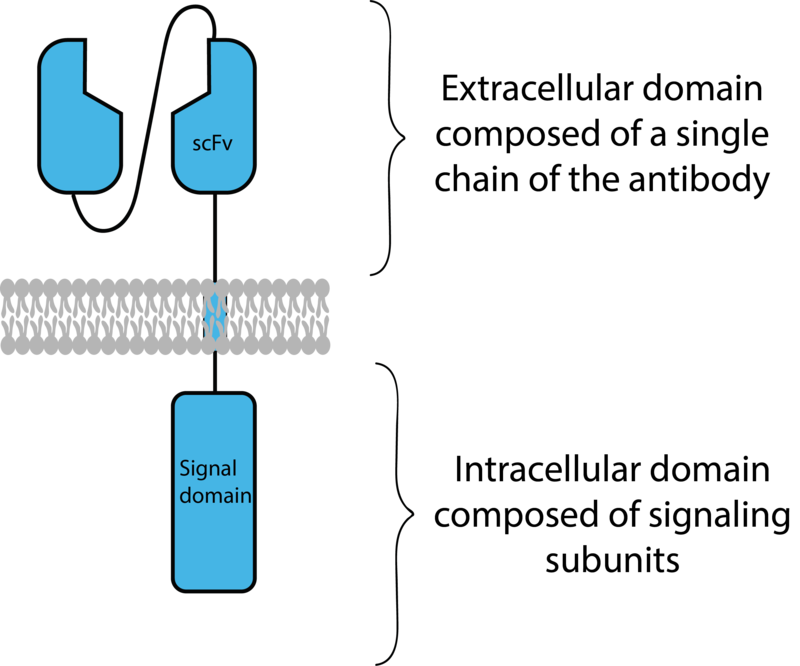 The recognition domain of the CAR targets specific molecules expressed on the surface of cancer cells and thereby triggers remarkable responses including activation and killing activity of T cells mediated by the signaling domain (Fig. 1) (Zhang et al., 2017). As one approach of adoptive cell transfer (ACT), CAR T cell therapy shows reduced toxicity because a patient's own immune cells are collected and modified to treat their cancer. How does CARTELTM Therapy work? T cells are first collected from a patient via apheresis, then cultured and engineered in the laboratory. These engineered T cells are infused into the patient and can express CAR only in the tumor microenvironment and not constitutively as in current CAR therapies (Fig. 2). In the last few years, CAR T cell therapy has achieved much progress. To date, two CAR T cell therapies were approved by FDA. The first one is Novartis’ Kymriah for the treatment of young adults with B cell precursor acute lymphoblastic leukemia (ALL) and the second one is Yescarta to treat adults with certain types of large B cell lymphoma. However, CAR T cell therapy is still facing many challenges (Magee, 2014). So far, most CARs are primarily used against hematopoietic malignancies (including ALL) and not solid cancers. Besides, the potential side effects are still under investigation. We thereby hope to tackle this developing field of synthetic immunotherapy, hoping to make this promising approach safer by controlling the expression of CAR in certain tumor microenvironment, which may allow the development of CARs against solid tumors .